This is the mother of all bendie lines. First produced in 1994, shortly after Hasbro's WWF Action Figure line ceased, this is probably the longest running WWF figure line ever. Figures were released in series consisting of 4 or 5 figures every few months. 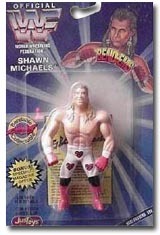 The color scheme of the packaging changed for each series and packaging also featured a tear-out illustrated trading card of the wrestler. Near the end of this line, amidst the huge surge in wrestling's popularity in the late 90's, Justoys put out a lot of product, most of it old figures repainted or repackaged. It was during this time that they released the "MIcroBendems" line which seemed to clutter toy aisles of Wal-Marts nationwide. Below you'll find lists of all the figures made, as well as an attempt to list all the different packaging variatons on the figures. (There's a lot.) You can also see some unproduced prototype Bend-ems, and a prototype ring!